This post was first published in December 2010. I have updated and republished it as part of Women’s History Month. I am amazed by the things Ellen went through in her life. Born in Westminster, Middlesex, England in 1833 Ellen had five siblings. 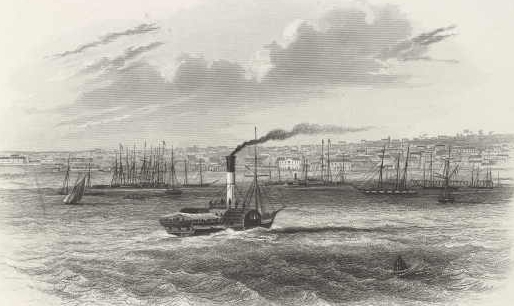 It is believed she came to South Australia in 1848 on the Princess Royal, when she was just fifteen, with her sister Eliza Isabella Chamberlain. Their parents had come out three years earlier. I can’t imagine travelling on a sailing ship to a new country, basically alone, at fifteen years of age. On the 2nd Aug 1850, at seventeen years of age, Ellen married Captain James Welsh at St Andrew’s church in Walkerville, Adelaide, South Australia. On the 4th Sep 1850 Ellen was on board her husband James’ ship the Harlequin travelling to Singapore when they were struck by a violent northwest gale. The ship was lost along with three of the crew. 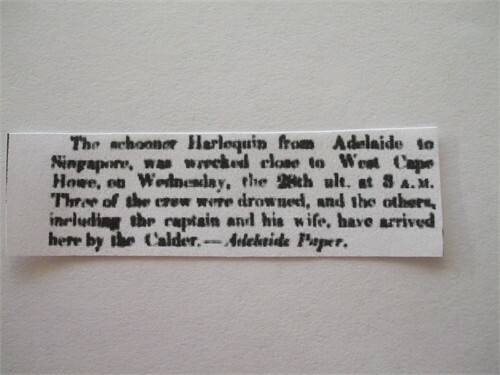 The gale then swung to the south-west, and at 3 o’clock in the morning of 4 September the Harlequin was driven on to the coast to the west of West Cape Howe, ‘a locality of the most fearful description for such a mishap, the coast consisting of almost perpendicular rocks of granite, near 200 feet high, and the water at the base having a depth of ten fathoms’ (Gazette, 20 September 1850: 2c). The vessel very quickly began to go to pieces, and three of the crew, the cook, a seaman and a cabin boy, were drowned. It was later stated that the seaman was drunk and made no effort to save himself. Mrs Welsh was three times washed off a spar that the crew were using to help get her ashore. On each occasion she ‘regained it by swimming, an art of which she was before entirely ignorant! and only knew by description’ (ibid.). The cook attempted to save his life by grasping at the dress of Mrs Welsh, who had gained a small rock; and as his efforts threatened the loss of her life, and could not save his own, his hold was broken off by one of the sailors, and he sank (Inquirer, 18 September 1850: 2c). A full description of the ship, its cargo, passengers and the rescue of Mrs Welsh (Ellen Mary) can be found in the Western Australian Museum Shipwreck Database. Ellen and James’ first child, William George Welsh was born in Pine Forest, South Australia on 7 Sep 1851. The family then moved to Victoria and another son was born in 1853, Charles James Welsh. Sadly Charles only lived for eight weeks. Ellen was far away from her own family back in Adelaide, I often wonder how she coped being away from home, with a young toddler and mourning the loss of her second child. 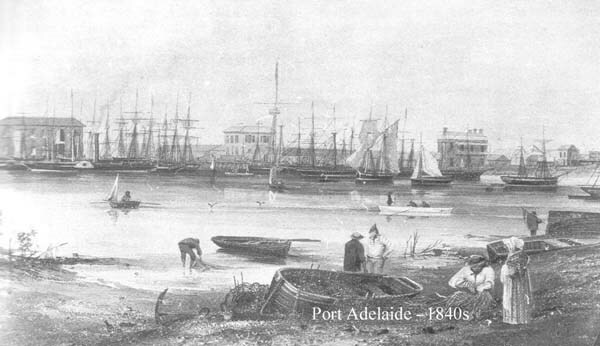 In 1855 Ellen and James are recorded as living in Geelong, Victoria where James had the position of Bar Pilot for the port. 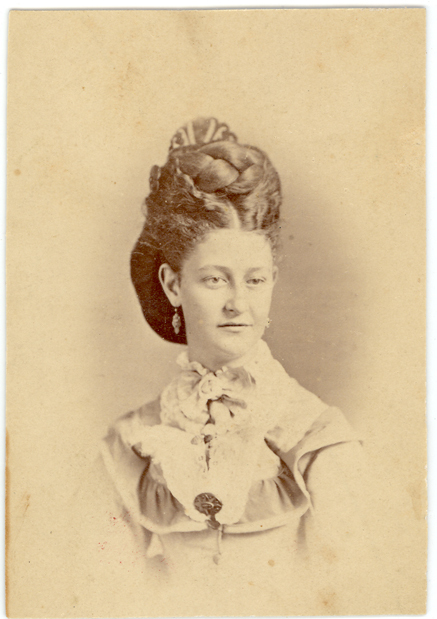 Ellen’s parents and her younger sister Eliza Isabella arrived in Geelong for a visit before returning to England. 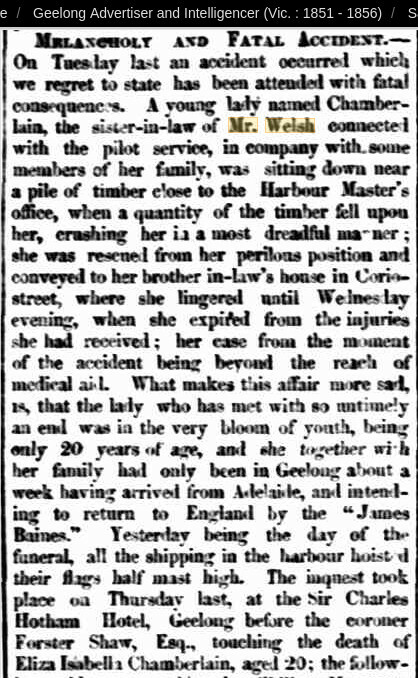 This article from the Geelong Advertiser is titled “Melancholy And Fatal Accident”. Eliza Isabella Chamberlain, Ellen’s sister, was killed by falling timber near the Harbour Master’s office on the 7th Mar 1855. The full article with the inquest details are on Trove. I don’t know how long the Welshs remained in Geelong, the next record I have is of the birth of their daughter Eleanor Isabella Welsh, my great, great grandmother, in 1857 in Melbourne, Victoria. I didn’t realise until I was writing this post that Eleanor Isabella would have been named after Ellen’s sister. Back in Adelaide in 1860 and another daughter is born to Ellen and James. Clara Elizabeth Welsh is born on the 22nd Aug 1860 in Queenstown, Adelaide, South Australia. Special thanks to Joanne Steele for all her research and for the photo of Eleanor Isabella Welsh. Stay tuned for part two of this amazing lady’s story. we shouldn’t moan about anything in our comfy modern lives. I hope you have plenty of her mitochondrial genes strength yourself! We can’t even begin to imagine what life would have been like for her. Looking forward to Part 2.